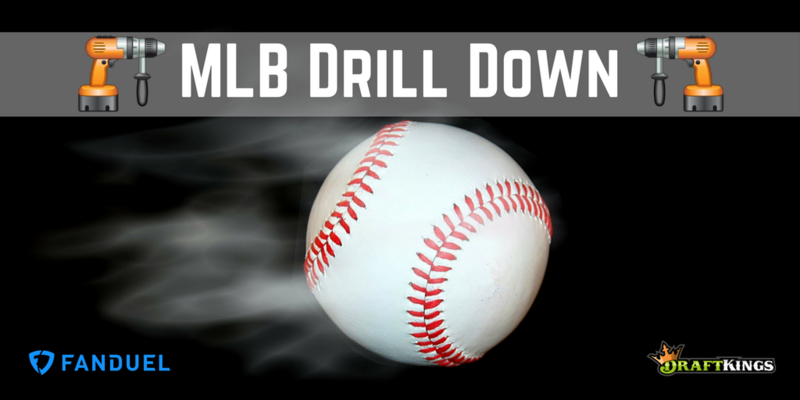 14 games in the baseball world tonight, which means you have a ton of decisions to make when making your DFS lineups. These are the types of slates that drive me crazy because I always feel like I’m leaving someone in an elite spot out of my lineup. Anyway, we move onward and try to send you into the weekend with some buckies in your pocket. Ladies and gentlemen, Alex Bregman is the best play on the entire slate tonight. We haven’t seen terrific power from Bregman yet this season but I think that changes tonight. For starters, we know Bregman and the rest of this Houston lineup are always in an incredibly good spot whenever they face a lefty, but they are facing Drew Smyly, a pretty bad lefty. Since the start of last season, Bregman ranks 27th in the majors in average (.309), 20th in wOBA (.397), 13th in strikeout rate (10.8 percent) and 21st in fly ball rate (44.1 percent) against left-handed pitching. Not only does he make a ton of contact against lefties but a ton of quality contact, too. So far this season, Smyly is coughing up a .302 batting average, .378 wOBA, 58.8 percent hard hit rate, 41 percent fly ball rate and 10 percent strikeout rate to right-handed hitters. Yeah, not great. Smyly also heavily relies on the fastball/curveball combo, a pitch mix that Bregman absolutely destroys. Since the start of 2018, only Chicago’s Javier Baez has been more productive against the curve than Bregman, who is hitting .385 with a .596 slugging percentage and .212 ISO score against the pitch. He has also been a top-20 fastball hitter during that span, too. Bregman truly checks off all of the boxes in this spot tonight and due to a slower start, the price tag is still extremely fair. As soon as I saw that the Angels were rolling out Felix Pena tonight, I immediately targeted the Seattle lefties on the other side. Pena is not a very good pitcher and has been awful against lefties. Last season, he surrendered a .274 batting average, .340 wOBA, 25.4 percent line drive rate and 41.6 percent hard contact rate, while only striking them out about 17 percent of the time. Vogelbach, meanwhile, has clearly shown plenty of power so far this year, especially against right-handed pitching, sporting a 50 percent hard contact rate and 43 percent fly ball rate against the handedness. He is striking out 25.5 percent of the time against righties but as we discussed, Pena hasn’t shown the ability to consistently strike left-handed hitters out. Vogelbach has serious home run upside tonight, just make sure he is in the lineup. It could be Jay Bruce at the DH spot, who I’d still be fine with since he is the 10th-best curveball hitter since the 2017 season, a pitch that Pena throws 37 percent of the time so far this season. And since 2017, Bruce is sporting a 1.48 percent home run rate, .244 batting average, .570 slugging percentage and .326 isolated power against the curveball. Whoever is in the DH spot for the Mariners tonight, I like quite a bit. Welcome to the Drill Down, Aaron Judge. The New York slugger is still striking out a lot (32.1 percent strikeout rate) but that comes with the territory when using him. Of course, we salivate over the power upside and in Yankee Stadium against Jakob Junis, there is plenty of it. Junis has some strikeout ability but he continuously surrenders the long ball. He coughed up 32 home runs last season and has allowed three so far in 2019. Junis allowed 1.87 HR/9 innings to right-handed hitters last season to go along with a 40 percent fly ball rate and 18.6 percent HR/FB rate. The pitch data also favors Judge here, as maybe no one in baseball tosses the slider at a higher rate than Junis, who is doing so nearly 42 percent of the time so far this season. Judge, meanwhile, ranks fourth in the majors against the pitch since the start of last season, sporting a .292 batting average, .517 slugging percentage and .225 ISO score against the slider. Junis still only has three pitches and pounds the strike zone at one of the highest rates in the league over the last two years. If one of those many sliders hangs in the strike zone, Judge will make no mistake and send it into the bleachers. Like to Bet on Sports? Try CentSports for your Sports Betting needs!